The British motor industry produced products that were influential and appealing around the globe, but the best ones still retained the character of the small rainy island from whence they came. Here are Jalopnik readers' choices for the ten most quintessentially British cars. 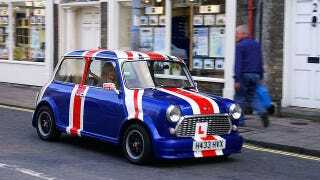 What Is The Most Quintessentially British Car? Why it's a proper English motorcar: Originally conceived in the very English tradition of dodging tax laws, the Moggie trike is the perfect vehicle for a nation of outdoors aficionados with very narrow roads and an affection for outdated, if ridiculously charming, traditions. Why it's a proper English motorcar: Partly to evade more tax rules and partly to give a two-fingered salute to the status quo, Colin Chapman designed a street-legal race car that could be built in a shed. It was such a brilliant idea – and such a perfect manifestation of that idea – that the same car is still in production well over fifty years after its introduction. Why it's a proper English motorcar: The English auto industry is now essentially names owned by people from other countries, but the spirit still lives on. The proudest inheritors of that tradition may be the cars wearing Aston Martin wings. Say what you want about Cold War spy movies: today's Aston lineup is the most desirable in company history, and the DBS is a worthy standard-bearer. Why it's a proper English motorcar: Before Bentley became a bridge line to Rolls-Royce, it built some of the biggest, brawniest, most glorious racing cars to ever pummel the Circuit de la Sarthe into submission. The big blower Bentleys have much presence and national character as Henry V's army at Agincourt. Why it's a proper English motorcar: Designed in response to the Suez Crisis of 1956, the Mini is one of the truly epochal designs in automotive history. It almost seems unfair to call it exclusively English; Sir Alec Issigonis gave the entire world a gem of a car. It still lives up to the deep national traits of being a perfect backroad runner and club racer. Why it's a proper English motorcar: A Supermarine Spitfire on four wheels. A cunning blend of old and new tech wrapped in an inspired design. The sexiest car ever made. Like the Mini it's too much of an international icon to be kept within national borders, but it remains one of the key signifiers of Swinging London. Why it's a proper English motorcar: A country that still appreciates its monarchy requires suitable wheels to accompany that attitude. Even as the world continues on the path of reckless mob rule known as democratization, there will still be a place for the very finest things in life, and more often than not they simply must be British. And cloaked in several tonnes of steel. Why it's a proper English motorcar: The British Empire once spanned the globe. Quite a few of those places had neither roads nor proper gentlemen's clubs, so the civilized geniuses at Rover saw fit to attach a well- trimmed sitting room to their capable Land Rover chassis and invented the luxury SUV. Why it's a proper English motorcar: The swan song of a long and noble tradition of affordable roadsters, the TR6 still represents all that is wonderful about proper English sporting motoring: stout mechanicals, classically appealing styling, minimal gadgetry, and a convertible top. Why it's a proper English motorcar: Speed, comfort, traditional styling and fittings, dignified presence, a winning mix of practical attitude and dashing style: the Mark 2 is England in vehicle form. This car could have been produced in no other country in the world. It is a worthy ambassador for the national traits we all appreciate.